Congrats Nicole!! Please send me your mailing address and I will get this out to you as soon as I can. I really hope to post some things soon--still doing DT projects and some magazine submissions right now but there is a long weekend so hopefully, I can make some birthday cards that are needed. Hi everyone! It seems like forever since I've blogged. Just too much going on right now. But I've made a few things, but this is the only one I can show you right now. I have some DT projects next week and I've been creating some things to submit for publishing. So I can't show those right now. Here's a quick 3x3 card I made last week using the new Close to My Heart Artiste Collection and some new Nautical Trendy Twine. I used the cartridge for the top cut the sentiment is on and the chipboard for background. The blue is a stamp--I just love how it looks :) I really love this set!! If you would like to order anything from Close to My Heart, I can help! Just send me an email or visit my website by clicking the link on the right. If you email me an order, I can give you a discount. Now, I'm sure you heard that Robyn, My Pink Stamper is not going to be producing any more products. While I am bit sad, I am very happy for her! I do have one last stamp set of hers that I can give away. It's the Sport-tastic set. So, if you would like to win this, please leave one comment and a way for me to contact you. I will leave this open until Wednesday night and announce the winner on Thursday. Hi everyone! Just wanted to do a quick post to let you know that Close to My Heart has a great stamp special starting today. 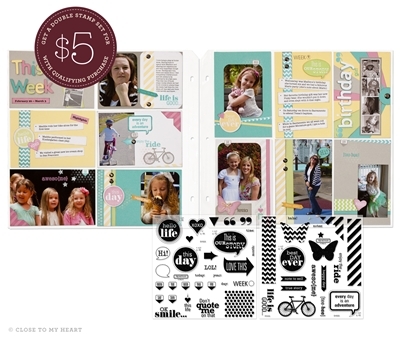 For just $5 (with a $35 purchase) you can get this fabulous 2-set stamp set! It's available until September 15. Let me know if you would like to place an order. 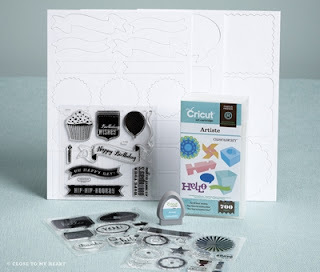 And don't forget about the fabulous new Cricut Artiste cartridge set. There is so much on this cartridge, it's really worth the price. I hope to have some more projects to show you from the stamps and cartridge next week! Email me for a discount :) or you can visit my Close to My Heart site by clicking the shop with me link on the right. I made this adorable puppy card to show you today. My friend Kimi had this great idea for the dog toy with some leftover twine. So it inspired me to make this card for my post today. I just used a few strands and twisted them together with knots on the ends. Then, the twine 'buttons' are so fun to do too. You start in the middle of the 3D dot and swirl going out. Don't forget to go over to the Trendy Twine blog and enter the challenge this month. The prize is some Krazy for Kraft and some of the brand new colors too! Hello! Today is the last card I had made in July for the My Pink Stamper Moo-ey Doodles release. This pattern paper is the other side of the paper I used on yesterday's card. It's great to be able to use one piece of paper and make a few projects! And the cows are so fun!!! The pictures aren't the best and the cards have now gone on to Operation Write Home so I can't take any new ones. The Krazy for Kraft Trendy Twine is on sale this month since it's the featured Twine. And be sure to visit the Trendy blog and join in the fun challenge over there! This was based off the Mojo Monday sketch last week, circle or square and is a 5 1/2 inch square card. Have you thought about Christmas cards yet? I think I will continue to make some, but I usually make a lot of one kind. It would be great to get them done early this time! Hi everyone!! I know I haven't been blogging lately--I just haven't been creating much. But I had a crafty weekend with some fun ladies this weekend so I have a few things to show. But 2 projects are for DT work for August. This is a birthday card that I made for a work friend. I used the new Cricut Artiste Cartridge that you can order today. The banner is chipboard from the kit you get with the cartridge and the happy birthday comes from one of the 3 stamp sets. Paper is from the Green Tea Stack and the leaf is also cut out of leaf paper in the pack too. I also used some Blue Berry Trendy Twine, pop dots and a Cricut cut for the flower. Next I have a cut from the cartridge. My friend Kimi from the group this weekend had this great idea when she saw this cut in my handbook. It's a great twine holder!! I cut them at 3 inches and they were perfect for some mini packs of Trendy Twine that I had getting all knotted up in a box. I cut the slit in the top with some scissors to mirror those small floss holders. If you would like to order this cartridge, I can help you!! I became a consultant just a few weeks ago because of this cart :) You can click on my order link to the right or send me a message. I can give you a 20% discount if you mention being a blog follower if you order through email. Here's a picture of everything that you get for $99 (regular price without discount)--it's such a great deal! !